One of my most memorable flights to date was to Phoenix, without Randy, when Kacela was almost 2y and Calais was 3.5y. We managed surprisingly well, and no one had to drag me kicking and screaming back onto the plane to go home. However, it made me almost giddy to pay for that first ticket after Kacela turned 2y! The three of us were crammed into two little seats and all Kacela wanted to was to be ON HER OWN just like her big sis. For me, little kids (ages 2&3) are starting to get EASY (compared to 1 anyways!)!! They listen (relatively) well compared to toddlers, are capable of sitting still for more than thirty seconds, and can be easily entertained for the majority of most flights. This is my list of what to pack for flying with little kids. The first decision you have to make is what on earth you’re going to use to carry all the stuff! If you’re bringing a stroller then the diaper bag is nice cuz it can just hang off the back of the stroller when you’re in the airport and you won’t have to carry it. If you’re braving it with no stroller then I’d take a backpack. This lets you be hands free and it’s less cumbersome if you have to chase your little one around the airport! Essential Items – You NEED To Bring These! This is probably the most important item you’ll pack. It does triple duty as sustenance, entertainment and inner-ear equalizer, plus usually if the kids have something in their mouths they’re quiet! I always bring chewy snacks for take-off and landing to keep the jaws moving and help little ears equalize. If your LO isn’t potty trained yet, you’ll need to pack diapers. My general rule is to pack twice as many diapers as you think you’ll need. If you’re using pull-ups, I’d recommend normal diapers for the plane. The bathrooms are tight, and sometimes you just have to change your kid at your seat. A diaper can be changed without having to take off your kiddo’s pants making it easier to do in small spaces, and potentially a little bit faster. If you LO is newly potty trained, I’d consider having them wear a pull-up on the plane. It never fails that they need to go to the bathroom as soon as the safety demonstration starts and you know it’s going to be a good 20min before the seatbelt sign comes off. Even if they don’t wear the pull-up, I’d still bring one or two on the plane. Then, if you have to, you can do a quick change in the seat and they can “do their business” in the pull up while the seatbelt sign is still on. Potty trained or not, ALWAYS bring lots of wipes! Once the kiddos get their own seat they’re no longer exempt from the 100mL rule. If you pack a sippy-cup you can fill it up with water once you’ve passed through security, or have the flight attendant put some juice in it on the plane. I know it seems straight forward to pack a change of clothes for your little one, but make sure you pack a change of clothes for yourself too. At the very least bring an extra shirt. You don’t want to end up at your destination wearing a shirt that’s been soiled with any number of possible fluids! If you end up with wet or dirty clothes you’ll want a large waterproof bag to pack them away in. I used to use a Zip Lock bag, and they can still be a good option. Nowadays I try to find something more reusable, and love wet-dry diaper bags. If you don’t bring one with you, just take the “puke bag” out of the seat pocket. They usually have plastic lining to keep any dampness away from the rest of your stuff. Not only does a scarf look cute on mom, but it does a great job of doubling as a blanket or pillow for sleeping kiddos. It’s also really good at hiding spills and stains on your shirt if you forget to pack an extra set of clothes for yourself! If you want to get some sleep yourself without having your little one flopping all over you all night, you need one of these inflatable travel pillows! It fills the space in front of the seat making a lovely little bed for your kiddo. Couple it with a pillow and a blanket and suddenly your little one’s upgraded to first class! Photo Courtesy of 1st Class Kid Travel Pillow. My girls loved their Zoobies! They’re a little bulky for carry-on, but they have a blanket inside (so your scarf doesn’t get stolen) and can also be used as a pillow. They also double (triple) as a comfort item to calm a potentially nervous little one. The closer the girls got to 4 the less they used their Ben Bat neck pillows, but they were a staple in the “younger years”. We always bring these along if we’re doing any driving at our destination, and they also work as a pillow on the plane. Kids can sleep in such awkward positions so it is nice to have something that supports their neck in almost any position they manage to get themselves into. To be honest, we bought one of these a few years ago and have never used it. I just can’t bring myself to haul around the extra weight. I do have friends that use the Kids Fly Safe and love it. The key – you have to use it on the FIRST flight that they have their own seat so that it starts as the norm. We, unfortunately, didn’t do this and just haven’t gotten around to introducing it after the fact. We’re maybe a bit on the lax side, but if you want optimal safety, this is for you! Our still-in-the-box Kids Fly Safe. Some planes, especially small ones, can be VERY noisy! You can keep your little one’s hearing safe by using ear muffs. These cute little KidCo ones will do the trick nicely. Most of the kid’s entertainment items can fit into their own backpack. It helps keep them a little bit responsible, and they feel so grown up carrying it all themselves! We have a general rule – everyone carries their own stuff on the plane. Yes, sometimes we end up carrying a kids’ backpack, or the kid AND their backpack, but for the most part each of us carries our own. These little Osprey packs are fantastic. They’re comfortable to wear and fit a surprising amount of stuff. They’re a miniature version of an adult’s technical pack, great quality, and the kids’ feel grown up wearing them. Plus, other passengers think they’re the cutest little kids running around with their stylin’ packs. Both our girls the Osprey Jet 18, and it’s a bit big. The Osprey Jet 12 would be ideal at this age. The girls getting ready to board with a weekend’s worth of stuff in their pack…clothes, shoes and plane entertainment. We were in Walmart one day and I stumbled across some lego baseplates for about $6 a piece. I impulsively picked up two green ones and threw them into my cart. Paired with a small container of lego bricks these are now a staple for the plane. Hours of entertainment, creativity, eye-hand coordination, NO ELECTRONICS, and if you pick bright colours they’re easy to find when they get dropped on the floor! 3-year old Kacela will spend an entire flight building and creating with her lego. Lego is by far my favourite activity for the plane as it’s easy to pack and provides some great screen-free entertainment that can last for hours! These are awesome because they can only write on their own colour wonder paper. The downside is they’re relatively expensive, but since we only use them on the plane it’s worth it. The Colour Wonder mini markers are the best for the plane. This is a snack and game all in one!! Bring some string (or dental floss) and cheerios (or fruit loops) and your little one can make themselves a necklace and then eat it! Either a brand new book or an old favourite is always a staple. It’s especially useful for take off and landing when you can’t have headphones on or the tray table down. In my opinion this is a must on any flight longer than about an hour. An iPad/iPhone/Tablet and good pair of kid’s headphones can provide hours of quiet entertainment. My favourite apps are anything “Toca Boca” as well as “Mee Genius”, an app full of kid’s audio books. I love this for self-guided reading. The biggest downside to the Jr version is there’s no headphone jack. I find it’s usually loud enough on the plane from ambient noise that it doesn’t usually bother anyone. My girls loved this because it was something they could do themselves! They would each bring a few books and then trade. 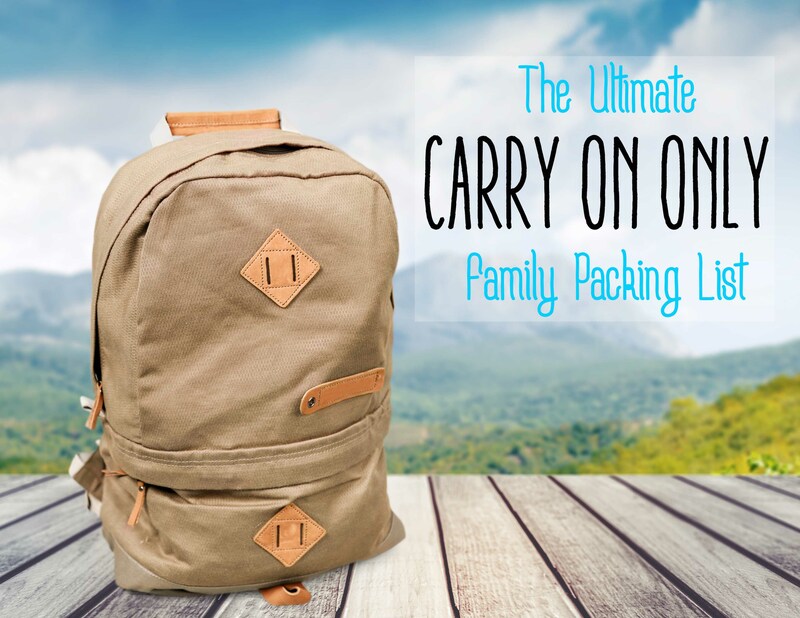 Check out my post to Pack the Perfect Little Kid’s Carryon for an idea of what to pack for distractions! Make sure you check out my “Tips for Flying with Little Kids” for tips to make your flight go as smooth as possible. Now you’re packed, these tips will make your flight a breeze! Do you have any other must-haves for your little kids on the plane? This post contains affiliate links. By purchasing through these links you won’t pay anymore, but I’ll get a tiny little commission that will help keep the site running. Thanks for your support! I am a wife, mother and professional schemer! I love planning travel...and of course, actually traveling with my family. My favourite experiences tend to happen off the beaten path, and I'd love to show you that it's possible to travel everywhere with your kids! Hello. Ubaldo travel with Two babies . 2 and 1 years old. Which stroller do you use for carrying toddlers at AirPort ? My favourite is a small, collapsable, double umbrella stroller. It’s SO nice to be able to put both kids in a stroller, but I don’t like anything too big or bulky for an airport.